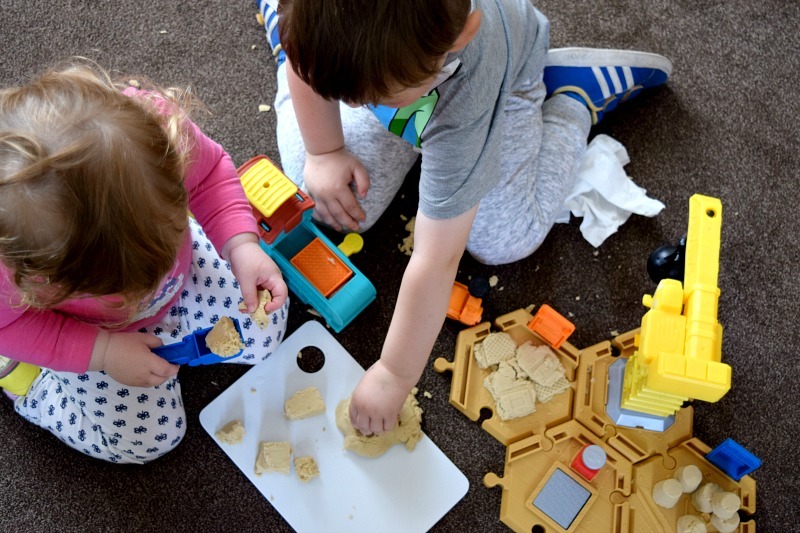 When we were sent the Bob The Builder Mash & Mould Playset to review, the kids were excited and I was simply dreading the mess. I am not good with messy play since the last time we tried Play-Doh. Anyway I thought we best give it a try and see what we all thought so that fellow messy play haters can find an honest review. 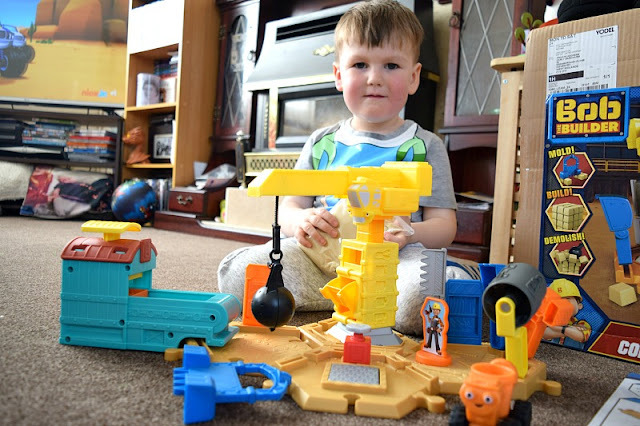 The Construction site play set itself is a good size. It comes with four hexagon shapes, which can be connected together however you want to order them, 1lb of Mash & Mould play sand, a mould press garage, tiny the crane with wrecking ball, Dizzy, the cement mixer, a double sided figure with Bob and Wendy on either side and a range of different tools. It is really easy to assemble. Then you just have to open up the sand and you are ready to go. The sand feels so strange, it crumbles so easily in your hands yet is completely mouldable. I put a chopping board out for the kids to lean on with the sand rather than the carpet. It can be rolled up into a ball and flattened just like Play-Doh BUT if you accidentally get it all in the carpet, you simply pick up another piece and dab it on the carpet and it pulls it all up leaving no mess! It is magnetic just like many of these magnetic sand sets around (which I didn't believe would work) and it is brilliant. Even with Elsie, who was stamping it around my living room, we didn't have any mess once we put it all away. The set itself has so many different stamps and moulds dotted around. 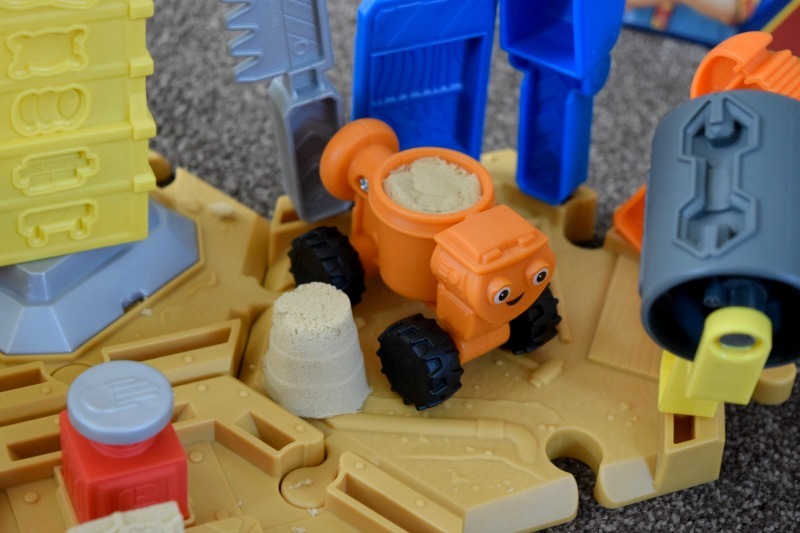 Inside Dizzy's cement mixer they can create construction barrels with the sand. The Wendy/Bob figure had a footprint stamp at the bottom to create footprints. Tiny the Crane is covered in moulds, one where you put sand in the tray that opens which creates a brick, then he also has small tool moulds all down his side. Zach and Elsie will play with this for hours creating all sorts to destroy with the wrecking ball. The only negative I found was once you build tiny the crane and attach him to one of the hexagons, I can't find a way to take him apart again and so he doesn't fit back in the box with all of the other pieces. If anyone figures out a way to do this without breaking him, I would love for you to share. Apart from that, the play set has gone down really well and I don't hate the Mash & Mould play sand, so I would call it a success.